Just in case you were wondering...there was a bit of snow left over on Wednesday morning and I did find some tracks in the garden...raccoons. That is no surprise, it appears as if they were just using the yard as a thoroughfare, headed to a large spruce tree in the neighbors yard (at least one raccoon and a few squirrels live in and around that tree). 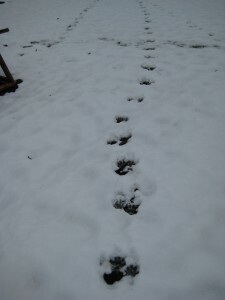 Fortunately, there were no tracks near the chicken coop!